As Editor of the "Zarya." Russian lawyer and author; born July 7, 1847, in a Jewish agricultural colony near the village of Sophiefka, district of Lutsk. At the age of ten he entered the rabbinical school of Jitomir. Afterward he entered the classical gymnasium in Kamenetz-Podolsk, but had to leave the institution on account of ill health. Later he went up for his final examinations at the gymnasium of Jitomir, and entered the law school of the University of Kiev. At the end of two years he was transferred to the University of Odessa. In 1871 he removed to St. Petersburg, passed his final examinations at the university of that city in 1872, and soon after received an appointment as assistant district attorney. He, however, devoted but little time to his legal practise, and in 1875 went to Vienna and later to Berlin. 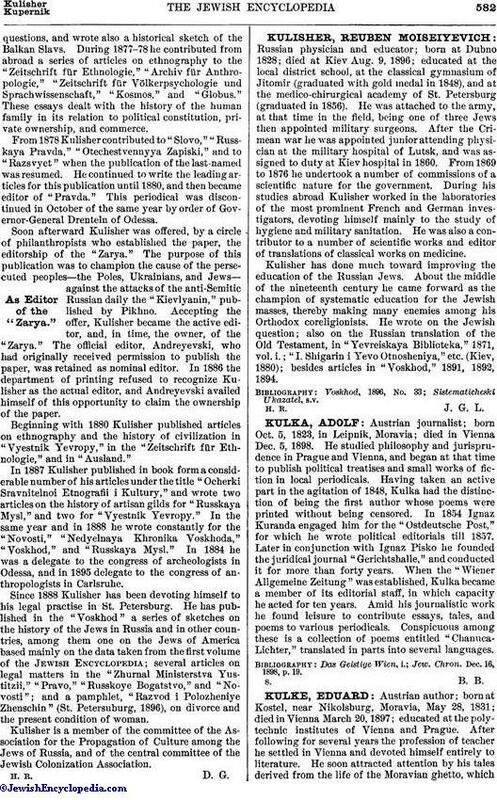 Kulisher's first printed article was a contribution on the status of the Rabbis, published in 1866 in the then recently established periodical "Glasny Sud." 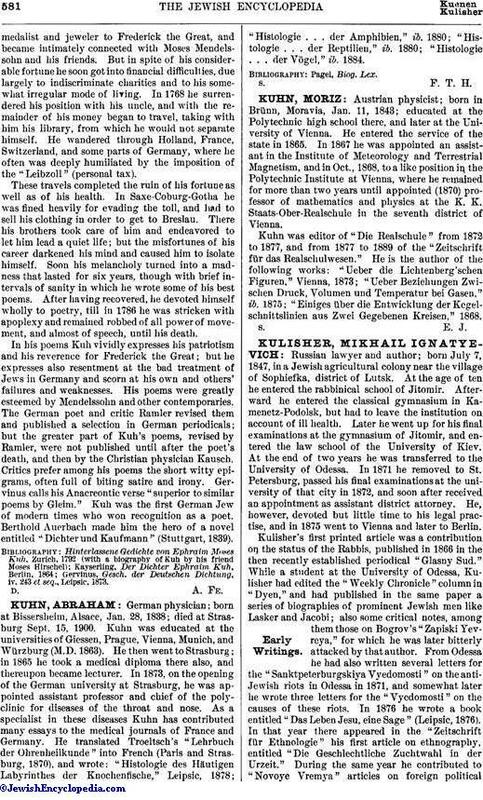 While a student at the University of Odessa, Kulisher had edited the "Weekly Chronicle" column in "Dyen," and had published in the same paper a series of biographies of prominent Jewish men like Lasker and Jacobi; also some critical notes, among them those on Bogrov's "Zapiski Yevreya," for which he was later bitterly attacked by that author. From Odessa he had also written several letters for the "Sanktpeterburgskiya Vyedomosti" on the anti-Jewish riots in Odessa in 1871, and somewhat later he wrote three letters for the "Vyedomosti" on the causes of these riots. In 1876 he wrote a book entitled "Das Leben Jesu, eine Sage" (Leipsic, 1876). In that year there appeared in the "Zeitschrift für Ethnologie" his first article on ethnography, entitled "Die Geschlechtliche Zuchtwahl in der Urzeit." During the same year he contributed to "Novoye Vremya" articles on foreign politicalquestions, and wrote also a historical sketch of the Balkan Slavs. During 1877-78 he contributed from abroad a series of articles on ethnography to the "Zeitschrift für Ethnologie," "Archiv für Anthropologie," "Zeitschrift für Völkerpsychologie und Sprachwissenschaft," "Kosmos," and "Globus." These essays dealt with the history of the human family in its relation to political constitution, private ownership, and commerce. From 1878 Kulisher contributed to "Slovo," "Russkaya Pravda," "Otechestvennyya Zapiski," and to "Razsvyet" when the publication of the last-named was resumed. He continued to write the leading articles for this publication until 1880, and then became editor of "Pravda." This periodical was discontinued in October of the same year by order of Governor-General Drenteln of Odessa. Soon afterward Kulisher was offered, by a circle of philanthropists who established the paper, the editorship of the "Zarya." The purpose of this publication was to champion the cause of the persecuted peoples—the Poles, Ukrainians, and Jews—against the attacks of the anti-Semitic Russian daily the "Kievlyanin," published by Pikhno. Accepting the offer, Kulisher became the active editor, and, in time, the owner, of the "Zarya." The official editor, Andreyevski, who had originally received permission to publish the paper, was retained as nominal editor. In 1886 the department of printing refused to recognize Kulisher as the actual editor, and Andreyevski availed himself of this opportunity to claim the ownership of the paper. Beginning with 1880 Kulisher published articles on ethnography and the history of civilization in "Vyestnik Yevropy," in the "Zeitschrift für Ethnologie," and in "Ausland." In 1887 Kulisher published in book form a considerable number of his articles under the title "Ocherki Sravnitelnoi Etnografii i Kultury," and wrote two articles on the history of artisan gilds for "Russkaya Mysl," and two for "Vyestnik Yevropy." In the same year and in 1888 he wrote constantly for the "Novosti," "Nedyelnaya Khronika Voskhoda," "Voskhod," and "Russkaya Mysl." In 1884 he was a delegate to the congress of archeologists in Odessa, and in 1895 delegate to the congress of anthropologists in Carlsruhe. Since 1888 Kulisher has been devoting himself to his legal practise in St. Petersburg. He has published in the "Voskhod" a series of sketches on the history of the Jews in Russia and in other countries, among them one on the Jews of America based mainly on the data taken from the first volume of the Jewish Encyclopedia; several articles on legal matters in the "Zhurnal Ministerstva Yustitzii," "Pravo," "Russkoye Bogatstvo," and "Novosti"; and a pamphlet, "Razvod i Polozheniye Zhenschin" (St. Petersuburg, 1896), on divorce and the present condition of woman. Kulisher is a member of the committee of the Association for the Propagation of Culture among the Jews of Russia, and of the central committee of the Jewish Colonization Association.